That conversation brought to mind something I’d read many years ago. A hotshot (in my estimation) weaver, whose name I’ve long since forgotten, wrote somewhere that she considered she’d had a good, productive year if she had woven off 100 yards of cloth. That struck me then, and has for years, as a goal so distant and so huge that I’d never be able to achieve it. But from time to time, that big number swims back into my mind, and reminds me once again of what a Real Weaver can do. For several weeks, that conversation rumbled around in my mind repeatedly, so I decided to see just what I HAD accomplished. For at least twenty years, I’ve kept thorough notes — organized and consistent — on every warp I’ve put on a loom and woven off. Every single one. So I went to my dear old notebook and added up the yardage of all the warps I’d finished so far this year; at that time it was 84 yards, and immediately I knew that by the end of the year, I would have attained what I’ve always considered an impossible (for me) goal — 100 yards woven in one year. 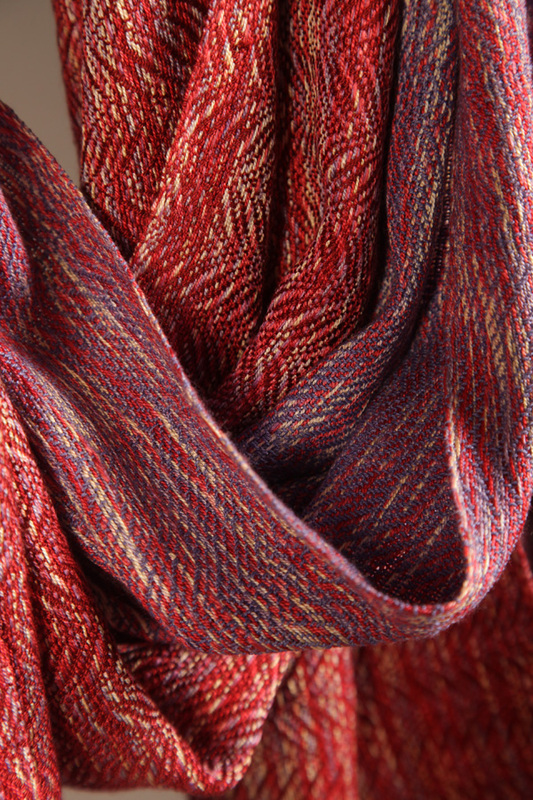 Yesterday, when I finished the second scarf in the Merlot series of four, the final total for the year hit 103 yards. I know it’s true, and I don’t quite believe it. There are only a few hours left in 2011, a year which has been unusually difficult and challenging for many folks, including me. Still, I sit here at the end of it, looking back and looking ahead, reviewing and planning, and I notice mainly how good it’s been, how pleased and satisfied I feel, how glad I am to be alive and aware and connected to good people and good work. Ann: Margaret forwarded your blog to me, with the absolutely stunning photograph of your fabric. That is so much better a way to show it, than just a straight head-on image. Who took that? I’m very impressed with the imagination to do it that way. It flatters your work in a super way. Congrats. Ed my friend ~ Michael Stadler is the photographer. He and I have worked out some unusual ways to show my work two-dimensionally. 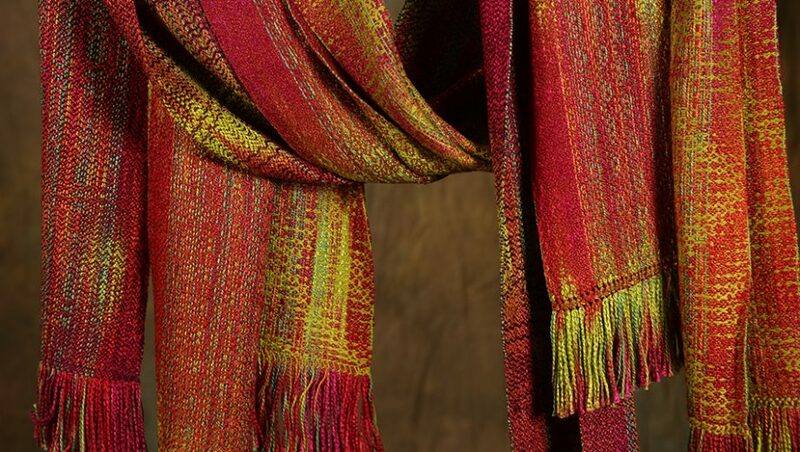 I wanted the images to look very different from the “norm” in the weaving world, and to show the character of the fabrics as much as possible. I wanted the images, as the work itself, to have a kind of signature look. I’ll pass your compliment — one photographer to another — on to Michael.